We have had a miserable summer so far. The politics of the country and the mood of the people both have been distinctly gloomy. The weather just seems to reflect the general goings-on in the land. Andy Murray's recent victory at Wimbledon was the silver lining on an otherwise dark cloud hovering over Britain. The English cricket team too has been playing its part with aplomb in the recently concluded test and one day series against Sri Lanka. As is the Welsh football team. We will not talk about the English football team as it will only add to the feelings of gloom and doom. All in all, sports seems to be doing its part in keeping the mood of the British people in a somewhat ebullient state. Next up, the summer Olympics in Rio. I am hoping that Team GB will continue with the stupendous form exhibited in the London Games four years ago. If you are planning an Olympics-themed party and are looking for inspiration, here is something for you. 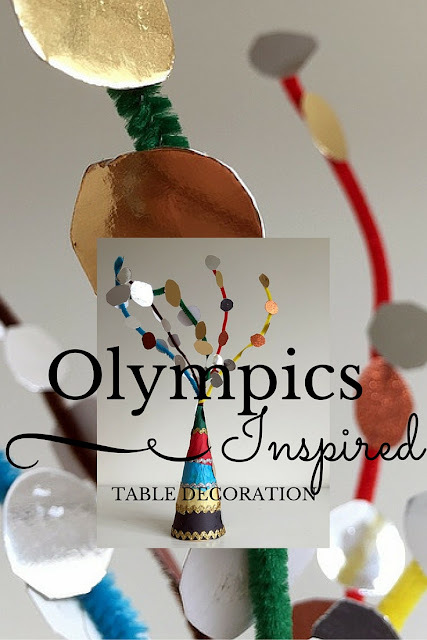 I have drawn inspiration from the five Olympics rings and the coveted gold, silver and bronze Olympic medals that are the highlight of any athlete's career, to design a table centrepiece decoration. The idea popped into my head as I sat mulling over the contents of this month's Bostik craft box. The glistening gold, the silken silver and the bright bronze drew me in. I had to incorporate them in my craft. Pipe cleaners - one each in black, blue, yellow, green and red. These are the colours of the Olympic rings and I wanted to incorporate these in my creation. Start by layering the strips of tissue paper around the cardboard cone. This step is similar to the layering we did for the dragon mask. Stick down the ends to secure the strips. Embellish the cone with pieces of gold and silver lace. I glued on bits in the transition zone between two different colours of paper. Next, snip off the pointed end of the cone. Twist one end of the pipe cleaners together, feed them into the top of the cone and secure with glue. Now bend the pipe cleaners any which way you like. Assemble the gold, silver and bronze 'medals' aka the circles cut out of card. Use Bostik Glu Dots to stick these to the pipe cleaners and down the cone. There you have it. Our Olympics inspired table decoration is ready to occupy pride of place at your theme party. More than anything, it gives you one more thing to do with the kids over the summer holidays! I love how the 'medals' glimmer and shine as they catch the light. Do you think your guests will be impressed? This is so creative! Will definitely have to try this out with the little ones! This looks great :) Very creative and unique. Looks like lots of thought has gone into this ..
That is such a fun design and easy to do too. I love it! It is also very kid-friendly! I could see the kids cutting out the circles! I love the finished look. It is so cute. This looks great! You clearly have an eye for design. I think I'd struggle to know when to stop with the embellishments but I will give this a go. Very creative. Will follow your blog coz i need this kind of works in my job. Thanks.